UK Equity markets have taken 6-7 yrs in May this year to recover Index levels last seen in 2007, so we thought we would take what might seem an unusual time and our ever present statistical, evidenced based, un-emotional look at markets and put down some numbers. How about Japan? Would you believe it’s been nearly 24 years since the Nikkei was at its highest levels. 24 years!! Wow! I would hate to have been a 40-something Japanese investor looking to put some hard earned money to work in hopes of retiring in 20 years back in 1989. Now, most people aren’t investing a lump sum at one point in time and then holding onto it over the years; and thanks to that you can dollar cost average into the stock market to avoid 20+ years without ever seeing the investment be worth more than what you paid for it. But whether you buy all at once or average in, most investors in America are unwitting proponents of the buy, hold and hope investment strategy. Whether thanks to their brokers or force fed long only mutual funds in their 401ks, they are heavily invested in equities (stocks) on a “long term basis”, with most of their investable assets in mutual funds and supposedly “blue chip” stocks. These investors are generally not concerned about the inevitable ups and downs of the market because they rest easy in the knowledge that the market will go up over the “long term”. With their stock brokers and the supposed experts on television preaching that the market “always comes back”, they buy ’em, hold ’em, and hope that everything works out all right. But should hope be part of your investment strategy? How long will it take for the “market” to come back? Would you believe 5 years? 10 years? How about 20 years? What if it wasn’t for the rest of your life? Where would that leave you? Let’s look at some data to try and put this buy, hold, and hope strategy into perspective. 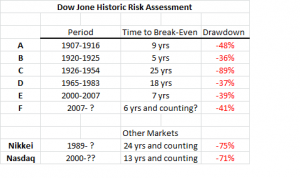 The table below shows several different periods in the past 100 years during which the Dow Jones Industrial Average took between 5 and 25 years to “recover” its losses. The data shows five different periods where the DJIA fell anywhere from 36% to 89%, then required 5 to 25 years to recover the loss. We all have heard about investing for the long term, but 25 years?? That’s a little longer than most probably think of long term. 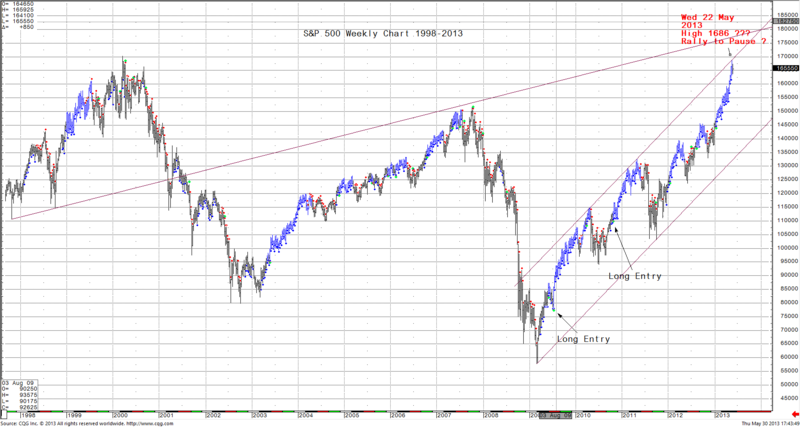 The period from 1962 to 1982 is particularly interesting, as the Dow gained just 43 points (5%) in 20 years. Yes, that works out to just one quarter of one percent return per year. If you think this is a phenomenon of the past, consider the figures in the beginning of this article which pointed out where we are right now compared to 1989, 24 years ago. Has anyone ever told you that you may have to wait 5 to 25 years to break even on your stock market investments? If they did, would you be a willing investor? I doubt it. But that is exactly what millions are doing with their buy, hold, and hope strategy. 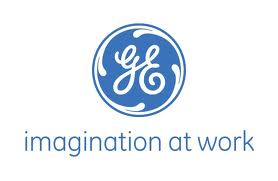 Consider that there is only one company (GE) currently in the Dow Jones Industrial Average which was a component of the index back at its founding in 1896. So the charts you see showing a nicely sloping upwards curve for the stock market as represented by the DJIA over the past 112 years assume you are switching the companies in your portfolio around just as the index is doing from time to time. 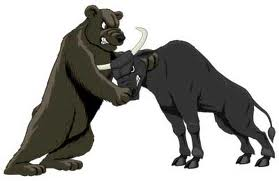 It just doesn’t follow that if I buy the 30 stocks making up the DJIA today, I will get the same performance as the DJIA over the next 10 years. 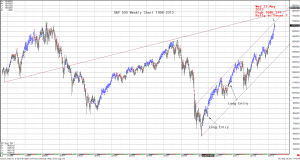 The powers that be cleverly hide this information from your everyday investor and try as we could, we could not find a chart showing the performance over time of the 1925 DJIA, or the 1985 DJIA, for example; walked forward over time. We did look at four companies who were in the 1999 DJIA (Eastman Kodak, Philip Morris, International Paper, and Allied Signal), but have since been removed to see what their performance was over that time. Would you believe they lost, on average, -63% of their value, since Nov. 1, 1999. That’s quite a different story than the approx. -25% loss the Dow Jones Industrial Average has lost over that time, and shoots some more holes in the old buy and hold strategy. Now you’re hoping that not just the index makes it back to break-even, but some of the stocks that were dropped out of it as well. At Sinergi Management we are biased towards evidence based investment methodologies and lean towards Absolute return, so of course we will tell you that the uncertainty of the “Buy, Hold, and Hope”strategy is just one more reason to consider more Active Management for your portfolio. But even if you don’t heed that advice, please heed the warning that the old fashioned buy, hold, & hope strategy is a flawed one. At best, you may have to hold and hope for a very long time, and at worst (Japan/Nasdaq) you may be hoping stocks come back for an eternity. So don’t just hope that the market has turned around. Do something! Review your portfolio, rotate into and out of sectors and companies, and diversify into alternative investments or compliment strategies that can evidence their success. In a future BLOGI will show that how the argument of the pursuit of dividends alone will not compensate for this type of severe Capital erosion. After all it’s quite simple actually…… 100 to 50 is a fall of fifty percent but you need a +100% rise to get back to 100 from 50.. The reality is that the majority of people just don’t have the tools to convince them of when to go to Cash. Gerry has extensive experience in Portfolio management and trading roles. Passionate about systematic trading and evidenced based investment strategies he cuts through the "inefficient subjectivity" upheld by many market Commentators and provides you with "evidence" for you to consider. Use the Sinergi dashboards and powerful "associative search" functionality to get to the information that is important to you and your business.